If you’re looking for some Easy Halloween Party Food Ideas for Kids I have gathered some fantastic option for you to consider. You can include your kids in making most of these because they’re so easy! I think it would be fun to throw a party for a few of your kids and their friends and make some of these Easy Halloween Party Food Ideas I’ve compiled for you. Your kids are going to love it! With these cookies being grain free, gluten free and vegan they’re perfect for those that stay away from gluten and grains! 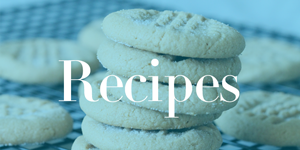 For the full recipe go here and see how easy you can put together almond flour, maple syrup, vanilla extract and jam to make these cookies! Buy your favorite OREOS, one orange tube of icing, Hershey’s Kisses and Wilton Candy Melts. Just squirt some orange icing onto the top of the OREO and stick the Hershey’s Kiss on top. Then cut the yellow candy melts into squares and stick on the edge of the icing. These are so easy and so cute! My daughter would love these because she loves OREOS! You might be the coolest Mom after you spend just a few minutes making these! With Marshmallows, black frosting, dipping chocolate and lollipop sticks these are yummy and so easy to make! If you love Twinkies, this one is not too hard. All you do is dip the Twinkies into some melted white chocolate after freezing the Twinkies for a little bit. and then add the candy eyes. Next, drizzle the extra white chocolate onto the Twinkies that are already covered in white chocolate to get the Mummy look. Stir together fruit punch, grape juice and unsweetened sparkling water in a cute glass pitcher and toss in a few blueberries on top. Make it cute by adding Halloween stickers on your glass pitcher and Halloween themed cups! I made these last Halloween for my kids and they were easy! First you melt 3 ingredients and then add chex and pretzels into the saucepan to mix everything together. Pour the mixture onto a lined 9 X 13 pan to cool for 2 to 3 hours. Then you cut the mixture into bars, add frosting and the candy eyes! Buy your favorite buns, cheese and meat and then just cut your cheese into triangles to make your teeth. Put two toothpicks into the sandwich where you’ll add pickles and tomatoes to make the eyes. If your kids don’t like pickles you could experiment with something else for the eyes! Buy Pudding Cups and Mix ins in your Halloween decor aisle or baking aisle to make these even more festive. Plus, there is a download you can print for FREE to decorate the pudding cups! With 6 ingredients you literally just buy everything at the store and toss it together in a bowl and you have a cute and super easy Halloween Trail Mix! This one is perfect for parties! Using just orange Kool Aid, Pineapple Juice, Sprite and Orange Sherbet this Halloween Punch is so cute and so tasty! Buy your favorite hot dogs, crescent rolls and mustard. Just dry your hot dogs off with a paper towel and roll into cut strips of crescent roll leaving a small space for the face at the end where you’ll make the eyes with mustard. I love that you can make Rice Krispy Treats or use store bought Rice Krispy treat for this idea. Just melt chocolate and use a butter knife to apply it to each Rice Krispy Bar. Then add your favorite Halloween colored sprinkles! With only 3 ingredients: Pretzel Sticks, Reese’s Peanut Butter Cups and Candy Melting Chips in a Fall Color, these are a quick treat to make. Melt the melting chips, dip the end of the pretzel stick into the melted candy and stick into the Reese’s Peanut Butter Cup. Set up for about 10 minutes in the refrigerator. You’ll need white chocolate melts, Halloween M&Ms and festive Halloween sprinkles to make this Candy Bark. You just melt the chocolate bark and pour onto a wax lined baking sheet. Then you just sprinkle with the M&Ms and sprinkles. Break it apart after it’s set up and that’s it! Just buy fresh strawberries, white chocolate, edible candy eyes and cake pop sticks. Cut the tops off the washed strawberries and stick the end of the cake pop stick into the melted chocolate then into the pointed end of the strawberry. Lastly dip the strawberry into the melted chocolate. Don’t forget to add the candy eyes before the chocolate sets up! If you need a healthier treat, these fruit cups with pineapple and mandarin oranges make a great treat. Just drop the two fruits in the bottom of a clear cup, top with RediWhip and add Candy Corn on the top! Melt butterscotch chips and stir in peanut butter. Then add marshmallows and chow mein noodles. Drop onto wax paper and add candy eyes. Just let set up for a while and you have some cute Haunted Haystacks! With only 3 ingredients consisting of Cheese Sticks, Pretzels and chives, these are so easy to make. Cut each cheese stick into one thirds, and then lengthwise you need to cut up the side about halfway all around the outside edge of the cheese. Stick a Pretzel stick into the end of the cheese where it’s not cut and wrap and tie with a chive! So this is just the easiest idea because you jut have to buy Cheese Puffs. You could set these on the table in a cute black bowl and put spider stickers on the bowl or make these cute little party favors! If you’re anything like my daughter she loves the combination of sweet and salty! Just dunk your pretzels in the melted chocolate and let rest on wax paper. While it’s still wet add a green M&M! This one isn’t as easy, but I had to share it because it’s so cute and kids love it! Cookie cake is a family favorite at my house. If you’re not sure about frosting the entire cookie cake, you can always modify this one and just decorate with the orange, yellow and white frosting around the outer edges! Don’t forget to Pin your favorite Recipes so you can find them when you start making your Easy Halloween Treats for Halloween! 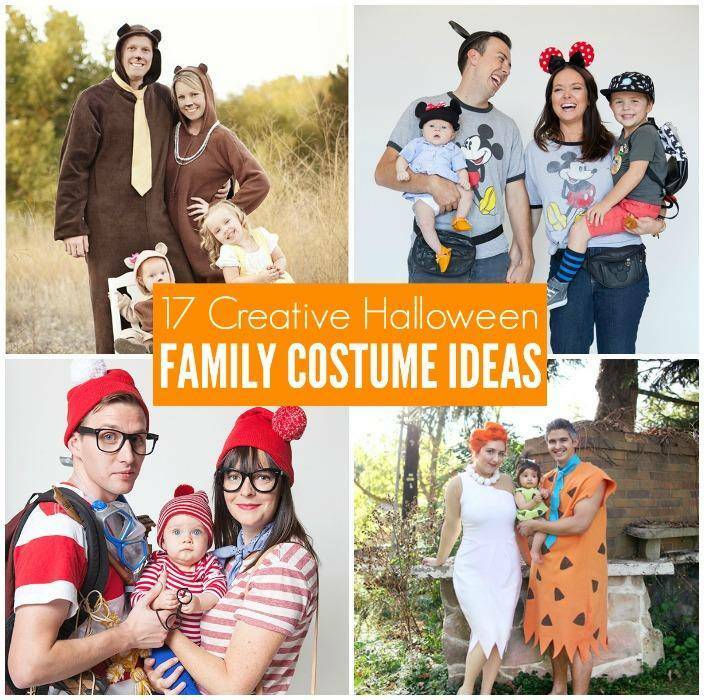 17 Creative Family Halloween Costume Ideas!